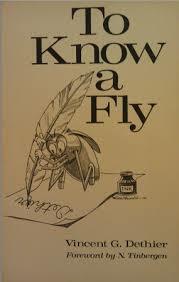 ‘To Know A Fly’ is an essay based on scientific experiment written by Vincent Gaston Dethier.He was (1915 – 1993) ,an American psychologist and entomologist.He was a pioneer in the study of insect-plant interactions.It has presented the view that every scientific experiment is to be carried out consciously and carefully because any experiment carried randomly may not give appropriate and acceptable result. The experiment always begins with act of faith over reality, cause and effect relationship, discovery by reason, our senses. It continues with an observation and a question. The scientist in fact alters the condition, observes a result and draws a conclusion. Therefore a man willing to conduct an experiment needs to be careful and conscious enough in this concern, since the most commonly committed scientific sin is the lack of proper experimental control. The text presents one example of carefully carried out experiment and the next the randomly conducted experiment. Once a gentleman by cutting off flea’s hind legs draws a conclusion that it hears from the hind legs since it couldn’t jump despite his order and he had already tried by amputating other parts of it. Similarly the next man concluded from his experiment that the intoxicating quality lies in glass not in water and even not in other alcoholic substances like bourbon, rum, scotch, rye, and gin and so on since all these substances were mixed with water. This kind of confusing correlation with cause and effect gives rise to fallacy and scientific sin. Finally, the text presents the extraordinary capacity of fly to test and identify the sweetness in substance. This is the most fruitful experiment conducted through shrewd observation. It extends out its proboscis and tastes the food item to ensure either it is sweet or not. It is too much sensitive. It tastes the food through the proboscis. As a piece of scientific writing, the text is trying to present the importance of experiment and alerts that one must be careful and conscious to carry out the experiment. Otherwise, it harms more than it helps. Similarly, presenting an experiment on fly informs the reader that nature has given every creature with own distinct qualities. In this, it is useless to regard human as superior creature in the world. The text presents the ideas on scientific experiment and its importance. Naturally, one must be conscious and careful but in every experiment such excessive consciousness doesn’t work. Since many scientific discoveries are taking suddenly and in random experiments. No scientist works being fixed on his invention.Whatever the discoveries take place, it is sudden and strange. As I went through the story, it really impressed me. I used to think that experiment is just to get the conclusion and they are easy. Everything is there and to experiment is to mix the things and observe them carefully. But now I know that to perform experiment needs a lot of care and knowledge. More than that, after reading it, I came to know and accept the fact that nature has equally empowered its creatures with distinct qualities.